IslayBlog.com - 27/Nov/2006: Islay Christmas Shopping? IslayBlog.com -> 2006 -> Islay Christmas Shopping? Less than four weeks until Christmas, time for a shameless plug and blatant self promotion for Armin's Little Islay Shop. 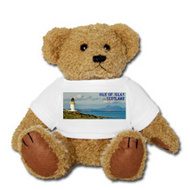 You might remember the T-Shirts from announcing the shop, you can now also buy a teddy bear wearing a T-Shirt like it. Then there are still the T-shirts and bag for the repeat visitors announced in August. One of the T-Shirts has been sighted at the Kennet and Avon Canal in England. In other words, if you're still looking for Christmas presents you might want to head over to Armin's Little Islay Shop and take a look. If you have any questions or suggestions for other products/designs let me know.